Clear and bright red, excellent cut flowers, produces 3-4 flowers per stem. Lilies are very hardy perennials and multiply year after year when planted in the garden. They are available in a wide selection of colors, heights, bloom time, and flower shapes. Extend your selling season by ordering with multiple ship dates and having them in bloom spring thru fall. 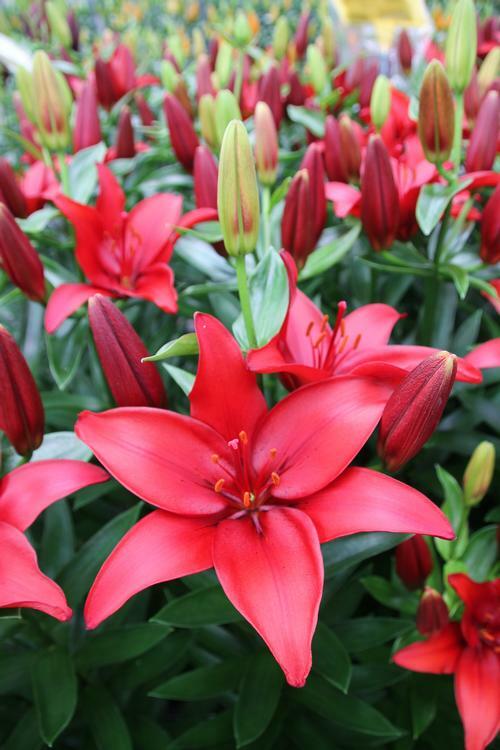 Grow lilies at 55-60" F night temperatures. Plant bulbs near the bottom of the container. Lilies develop roots along the stem and need 3-4"of soil above the bulb to develop properly. Keep evenly moist.